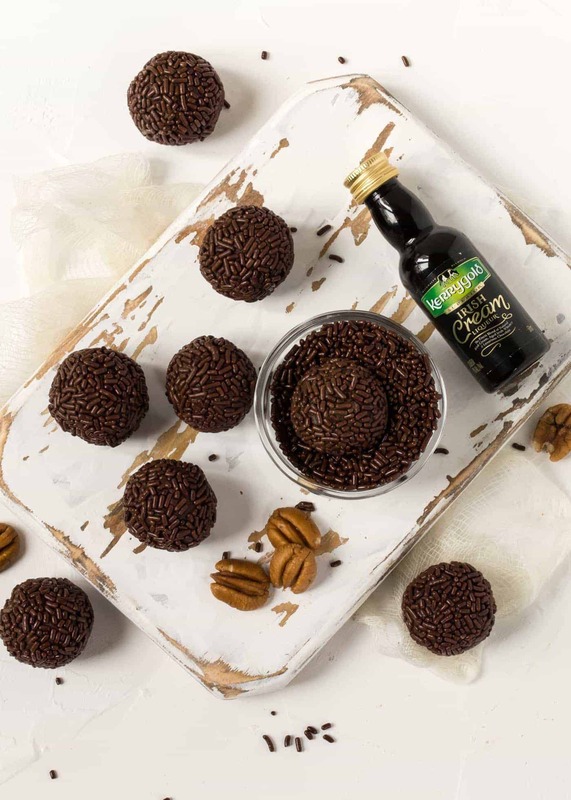 Add some sweetness to your holiday gift list this year with a batch of these no-bake Dark Chocolate Irish Cream Balls. Struggling for a gift idea for that hard-to-buy-for person? Some of the best gifts of the holiday season come straight from the kitchen. Every year I create a basket of delicious homemade goodies for my husband’s team at work. In the past, I’ve made some our family’s favorite holiday recipes, including chocolate chip cookie dough truffles, cranberry walnut bars and even all the fixings for one of our favorite cocktails, the chocolate martini. Whatever we come up with is always a hit. But this year? I’m pretty sure I’m knocking it out of the park with these Dark Chocolate Irish Cream Balls. 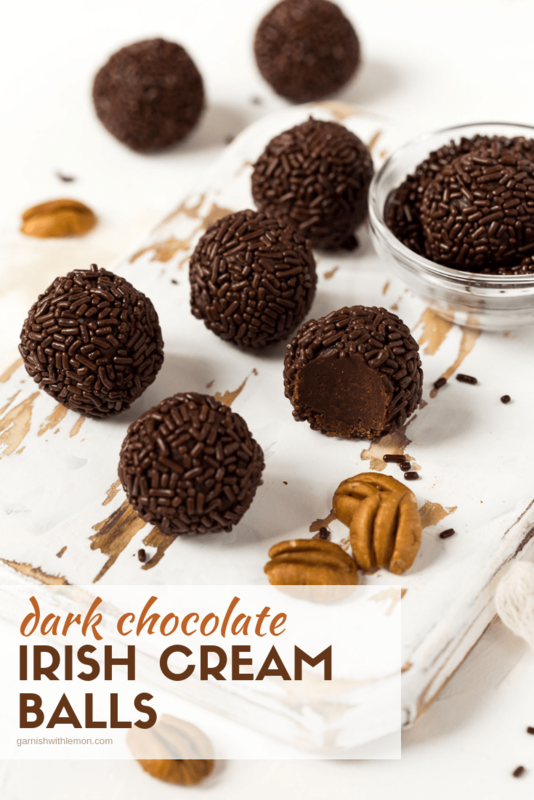 If you’ve ever had a rum or bourbon ball, then you have a pretty good idea of what to expect from these no-bake Dark Chocolate Irish Cream Balls. Think of them like a cross between a crunchy nut cookie and a rich chocolate truffle. Crunchy pecans and chocolate graham crackers (I used a gluten-free version to accommodate everyone on our gift list this year) are mixed with melted chocolate and decadent Kerrygold Irish Cream Liqueur. The result? Bite-sized treats that are dense, indulgent and full of holiday cheer. 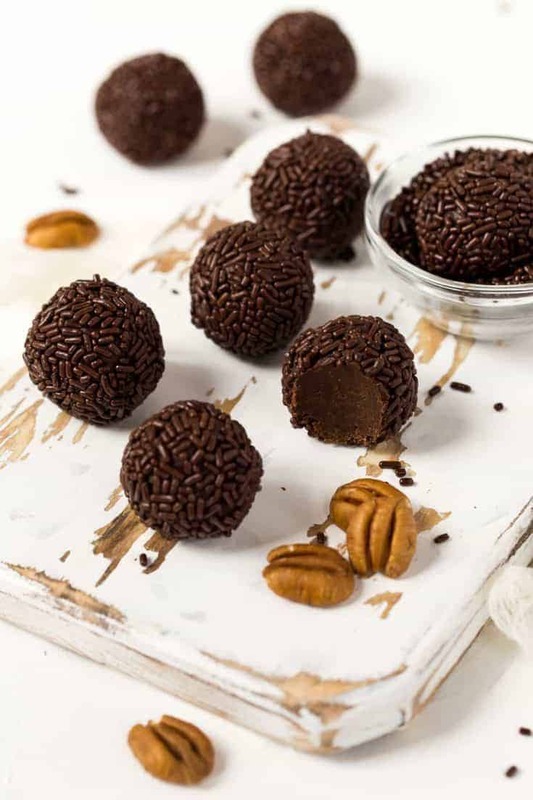 Tip: I rolled these Dark Chocolate Irish Cream Balls in chocolate jimmies, but you can also toss them with powdered sugar or cocoa powder for a totally different look. Hosting a holiday party? These Dark Chocolate Irish Cream Balls are a perfect addition to the dessert buffet, too. In fact, these treats are actually better when you make them a few days ahead of time and give the flavors a chance to meld together. Pop them in the fridge in an airtight container for up to one week and you’ll have the perfect sweet and slightly boozy finish for any get-together. These Dark Chocolate Irish Cream Balls make a great holiday gift! Place graham crackers and pecans in the bowl of a food processor and process until mixture resembles coarse sand. Set aside. Melt chocolate chips (either in the microwave, stirring every 30 seconds, or on the stovetop). Whisk in powdered sugar, sweetened condensed milk and Irish Cream Liqueur. Stir together pecan mixture and Irish Cream mixture until thoroughly combined. Cover with plastic wrap and refrigerate for at least 15 minutes. Remove chocolate mixture from refrigerator. Use a spoon or small cookie scoop to shape into balls (about 1”-1½ “ in size). Roll balls in chocolate jimmies. (You might need to use your hands to help the jimmies stick.) Store balls in an airtight container in the refrigerator for up to 10 days.